The Crooked River Lighthouse was built in 1895 to replace one on Dog Island that was destroyed in a hurricane in 1873. Authorities decided it would be better to have a lighthouse on the secure mainland rather than the exposed Dog Island. There were a variety of problems and it took a while for the Crooked River Lighthouse to be built. When built there was a keeper’s cottage on one side and the assistant keeper’s house on the other side. Electricity came to the lighthouse in 1933 and it became automated in 1976. The lighthouse was decommissioned in 1995 and is no longer an active light. It had a fourth order lens which was removed in 1976 because of mercury seepage. The lens was built in 1894 by Henri LaPaute in Paris, France. The lens is currently on display at the U.S. Coast Guard’s District 8 Headquarters in New Orleans. The two keepers’ cottages were sold to private individuals in 1964 and moved from the grounds of the lighthouse. One has since burned. 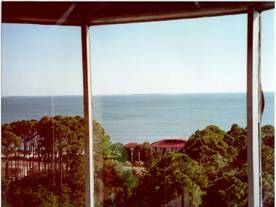 The Carrabelle Lighthouse Association (CLA) was organized in July 1999 to preserve, restore, and open the lighthouse to the public. At that time the lighthouse was owned by the U.S. Coast Guard, but had been deemed surplus property. Through the efforts of CLA the deed was transferred to the City of Carrabelle in August 2001. The Carrabelle Lighthouse Association manages the Keeper’s House Museum and gift shop, open Thursday – Sunday, 12:00 – 5:00pm. The public is invited to climb the lighthouse for $5.00 per person every Saturday from 1:00 to 4:00pm. 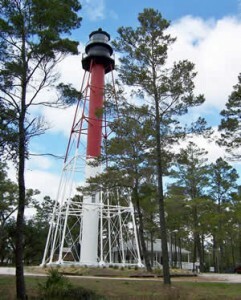 The lighthouse is approximately a mile west of Carrabelle on the north side of Hwy 98. Watch for signs on U.S. Hwy 98. Tour buses welcome! Please phone ahead for large groups 850-697-2732.